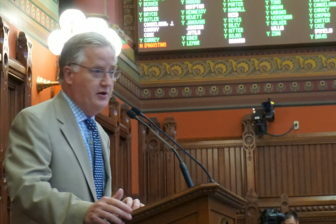 House Speaker J. Brendan Sharkey as the House votes for the first time to override a veto by Gov. Dannel P. Malloy. Gov. Dannel P. Malloy suffered his first veto overrides Monday, marking a turning point in the Democratic governor’s six-year partnership with the General Assembly’s Democratic majority. In an election-year distancing from a governor whose approval rating recently sank to 24 percent, the General Assembly overrode the vetoes of three bills and sustained five others. The House was willing to do four more overrides, but the Senate stood with Malloy on the others, including one sought by Comptroller Kevin P. Lembo that would have increased legislative oversight over tax breaks for economic development. The House voted in rapid succession to override the vetoes of five House bills and one Senate bill. The Senate overrode vetoes of two Senate and two House bills. But an override – technically re-passage of a bill – requires two-thirds votes in both the House and Senate, 101 votes in the House and 24 in the Senate. The split between the House and Senate yielded an unexpected defense of the House Democratic leadership and a denunciation of the Senate Democratic leadership for following Malloy by House Minority Leader Themis Klarides, R-Derby, whose goal this fall is to unseat House Democrats. House Speaker J. Brendan Sharkey, D-Hamden, who is not seeking re-election, and the man who would succeed him if Democrats retain their majority, House Majority Leader Joe Aresimowicz, D-Berlin, each stressed their chamber’s willingness to act independently of the governor. “Today we took the important steps to show our independence from the governor’s office on issues that we feel are important to the people of Connecticut,” Aresimowicz said. Senate Democratic leaders said little of why they sided with Malloy against the House on some bills, focusing instead on the overrides. Senate Majority Leader Bob Duff consulting with a deputy GOP leader, Kevin Witkos. “The state constitution gives us the final word,” said Senate Majority Leader Bob Duff, D-Norwalk. Several of the eight bills the governor vetoed from the regular 2016 session reflected a clash over executive authority and legislative oversight. The administration downplayed the overrides. “While the governor stands fully behind his vetoes, today was part of the legislative process, and we respect that process,” said his spokesman, Devon Puglia. House Bill 5437 requires the commissioner of social services to seek a new provider of non-emergency medical transportation for Medicaid recipients. House, 114-2. Senate, 35-0. Malloy said the bill was unnecessary as the administration already was taking steps to remove a vendor accused of failing to serve clients. He also called it “a clear intrusion into the function of the executive branch. House Bill 5420 allows the state treasurer to hire and set the salary for principal investment officers without permission from the Department of Administrative Services. House, 101-15. Senate, 34-1. Senate Bill 302 is intended to lessen the regulatory impact on small businesses by requiring an analysis of the potential for a regulation’s effect on small businesses. It also changed the definition of small business from 75 to 250 employees. Senate, 34-1. House, 106-5. Malloy said he supported the bill’s intent, but the language was too broad and burdened state agencies. House Bill 5247 would have implemented recommendations by the legislature’s Auditors of Public Accounts, expanded who must report suspected wrongdoing to the Office of State Ethics and tightened the rules for contracting without competitive bidding. House, 114-3. House Bill 5636 would have extended an apprenticeship tax credit and shifted from the executive branch to the legislature’s Program Review and Investigations Committee responsibility for regularly assessing the state’s economic-development tax incentives. House, 114-2. House Bill 5261 would have exempted coaches and referees who work for other than public school districts from labor rules for purposes of unemployment taxes and compensation. House, 101-15. Malloy said the bill created an overly broad exemption to state labor laws. Senate Bill 397 would have given municipalities the authority to grant total tax abatements in perpetuity to arts and culture groups, including for-profit entities such as movie theaters. Senate, 25-10. Malloy said the law already exempts non-profits from paying property taxes on arts and culture facilities. He objected to the inclusion of for-profits. 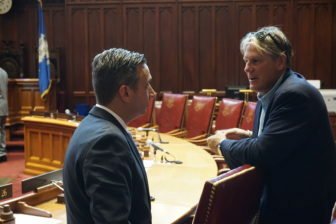 Neither chamber voted to override one vetoed bill: House Bill 5425, which would have established a framework for non-profits and banks to acquire, remediate and sell environmentally tainted property known as “brownfields.” Malloy said he supported the bill’s intent, but it could have resulted in millions of dollars in lost revenue to the state. Jacqueline Rabe Thomas contributed to this story.